Immersed in the nature and freshness of the woods, the Palazzo La Loggia B & B offers an excursion to the truffle to know its characteristics, its history and traditions linked to its picturesque and somewhat mysterious world. You can experience the emotion “d ‘andá pé truffles”, participate directly in the ritual of the search for truffles in the company of the “Tartufaro” and its inseparable friends with infallible sneezing, Lilli, Trilli and Stella. You will discover on the spot the most precious secrets of the Abruzzo truffle. • Welcome greeting with the presentation of the “Tartufaro” and its indispensable helper: the truffle dogs. • Brief history and characteristics of truffles. 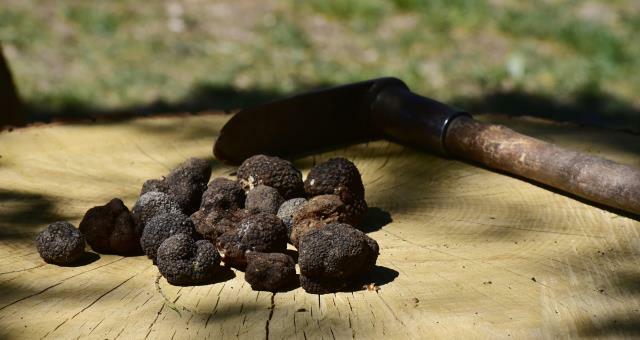 • Guided tour of natural truffles, with direct experience of the rite of “truffle research” on a panoramic path. • When returning “toast to the truffle !! “At the Palazzo La Loggia B & B. We recommend comfortable clothing and trekking shoes. If you want to feel lighter and leave the thoughts and problems of everyday for a while, suspended in a limbo of bliss, Palazzo La Loggia proposes to go to a suggestive place located on a beautiful plain surrounded by villages And Castles – The Aquarium Club of Air – where you will find experienced and passionate staff who will be happy to give you all the information you need and to welcome you on board the small Tecnam P2008 JC plane, 10-11 thousand feet high to fly The emperor of Abruzzo: the Gran Sasso d’Italia on the eastern and southern side. A spectacle of nature, and immense wealth for the area of which the Gran Sasso is part. The ancient art of chatting. For those who want to learn the fascinating and ancient technique of chatting, the good Alessandra will teach you to make beautiful earrings for you. 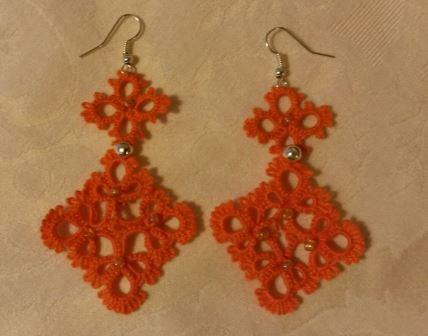 You will need wire, shuttle, thin crochet and scissors that we will provide. The duration of the course is three hours. 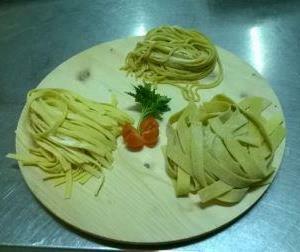 We learn to make homemade pasta. Alessandra of the Monteselva restaurant will give you the chance to put your hands in pasta using different types of flour, also those little known by making different types of dough. What will we do during the course? 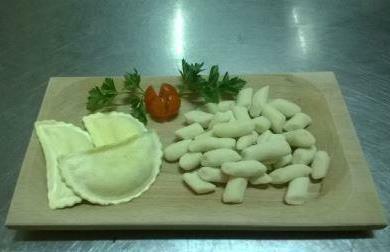 We will prepare a first typical dish of Abruzzese cooking with handmade pasta (guitar macaroni, maltagliati, fettuccine, pappardelle, volarelle, strozzapreti, sagne etc.) and we will end up in beauty tasting what produced. The cost of the course is € 30 per person. How to prepare a tasty sweet without using fat that is harmful to your health. This afternoon Alessandra of Monteselva Restaurant will give you the opportunity to prepare tasty and delicious homemade cakes and at the end of the meeting to taste the product together. Aquilane Zepples, Horseshoes, Mostaccioli, Amaretti, Burritos, etc. 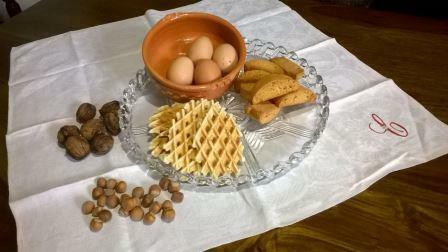 The cost of typical Abruzzese sweets is 30 euros per person. An opportunity to recover memory and peasant traditions and to reflect on the most advanced uses of acquired knowledge. Recognize useful plants and spontaneous herbs, know where they grow, how they grow, when they cut and how they are preserved. When returning to Palazzo Loggia the herbs collected will be cooked by you and tasted. 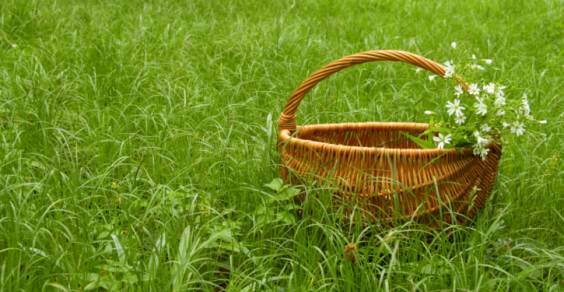 A theoretical and practical course to learn to produce natural soap for the person. You will bring your Soaps home and you can continue this activity even at your home. Every Saturday, Sunday and Monday of the months of March, April and May. 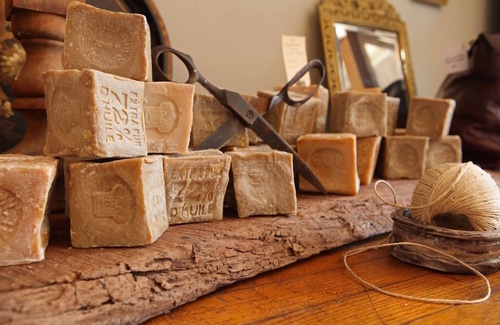 By staying at Palazzo la Loggia you will have the opportunity to take part in soap courses with our trusty craftsman. The Cold Course course has a duration of 3 hours, with the warm method with minimum 4 participants and takes place all morning and three hours in the afternoon. Learn how you worked on a journey between traditional materials and regional styles yesterday to be able to intertwine today and imagine creative uses tomorrow. 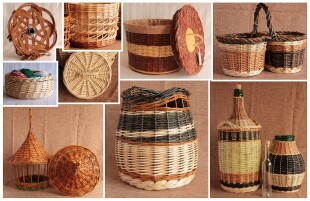 An ancient way of learning, going hand in hand with all parts of the cycle … from plants to baskets. By staying at Palazzo la Loggia you will have the opportunity to take part in the weaving course. An extraordinary opportunity for learning and convivial joy in the mountains of the local mountains. The Adventure Park “The Kingdom of the Mazzamurelli” is located in San Pio delle Camere – Loc. Cerquelle (road passing through San Pio delle Camere towards Carapelle Calvisio – Calascio) about 25 km from L’Aquila in a fairy woods Makes it a natural setting for exciting routes designed to satisfy both adults and children alike at the age of four. The environment stands out for its tranquility, green and unspoiled spaces, absolutely out of the urban setting. 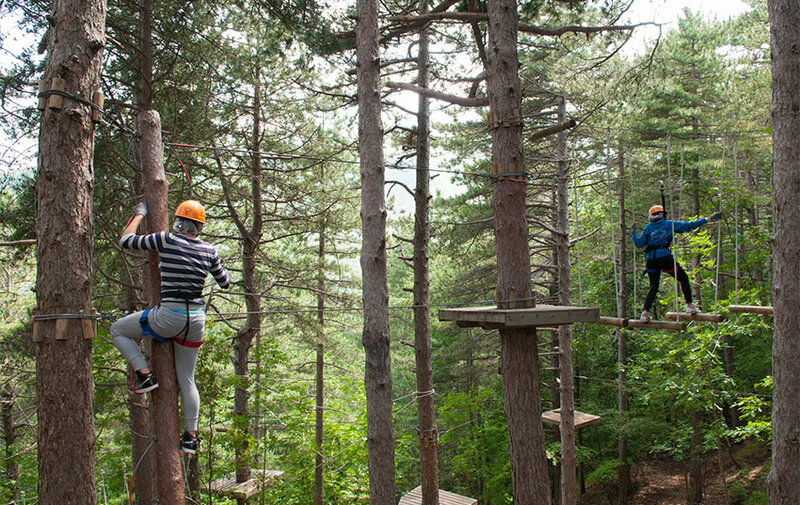 Our Adventure Park has an area of ​​about 30,000 square meters where you can experience a unique and exciting experience, there you will find 2 paths, 5 paths with varying degrees of difficulty and super cableways made in ALL SECURITY with a continuous line of life Without the possibility of unlocking, in full respect of nature. Other then the side activities to do: archery, hiking, orienteering, soccer at 5, environmental labs, children’s shows, walking area for relaxing walks in the green. Inside the park there are benches, barbecues and Pic-Nic tables for sauces or roasted meals. From the second half of October to mid-November in our fields is collected the spice queen, the world-famous saffron (Crocus Sativus). For those who are interested in the B & B Palazzo la Loggia offers to all guests a guided tour in the cultivated fields of saffron. We will go to the fields at 8 am in the morning to pick up the delicate deep purple saffron flowers then put them in a basket and dry them on the fireplace fire and all together make a sweet breakfast. We recommend clothing and comfortable shoes.